Forget fragile hard drives and sluggish, whirring discs, the future of movie-making is solid state. Solid state devices can be made smaller and lighter, they use less power and they’re less likely to break down or lose precious footage. And they don’t come much more solid than Canon’s first flash memory shooter. This stern black palmcorder has everything you might expect to find in a modern camcorder: a compact, lightweight (380g) design, video capture up to Full HD (1920x1080 pixels), an optically stabilised lens and that all-important SDHC card slot. Being Canon though, there are a few extras on board, not least of which is a generous 16GB of internal memory, which won’t last long if you take advantage of the HF10’s blistering maximum bit-rate of 17Mbps – that’s about the same as most Hollywood Blu-ray discs. The HF10 is beautifully easy to use, with a handy mode dial and clear menus on its gorgeous 2.7-inch display. The miniature push-to-select joystick can be a little fiddly if you’re struggling to breeze through options in a hurry, but otherwise the Canon is far more user-friendly than its gloss black Death Star-styling might suggest. Naturally, there are plenty of manual exposure, focus, colour and white balance controls, and that HD essential – a soft skin mode. The HF10 works well for either left- or right-handed users. The sharp, stabilised lens smoothly spans an impressive 12x zoom range that is longer than some rivals, although the wideangle setting remains a modest 43mm equivalent. One consequence of the HF10’s compact body is that the photo flash and video LED are side mounted, which means slightly uneven lighting in the dark. Video performance is nothing short of stunning. Colours are vibrant without looking pumped-up, detail is exceptional and exposure is unforced and natural. You have a choice of three frame rates – 60i, 24p and a new 30p mode previously seen on only significantly pricier camcorders. The fastest frame rate is perhaps better suited to high-speed action but frankly all three look smooth, crisp and cinematic. Even low light performance is relatively rich and noise-free, considering the HF10’s petite CMOS sensor. Still photos (3.2MP) are better than cameraphone snaps but no competition for a real camera, and the vanilla stereo audio sounds a little out-dated compared to Dolby 5.1 capture on the latest Sony and Panasonic AVC-HD shooters. While AVC-HC can be a real pig to edit (you’ll need a powerful computer with tons of memory), at least Canon includes Pixela editing software to get you started. 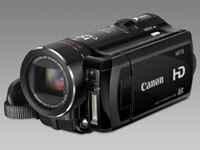 Overall, simply the best AVC-HD camcorder to date. You’ll save around £100 opting for the flash memory-free, but otherwise identical, Canon HF100. That’s not a bad option considering that fast 8MB SDHC cards can be had for as little £25 these days. The only feature you sacrifice is being able to record still photos simultaneously with video. Sony’s lightweight (240g) and titanium-bodied TG3 camcorder just begs to be touched, which is rather handy as its 2.7-inch screen responds to prods and pokes. A 10x lens provides detail, although you’ll have to invest in Sony’s MS Duo cards to feed its hungry eye. Now that solid state memory is so cheap, it’s great to see a manufacturer really providing a generous dollop of storage. 16GB is enough for around two hours’ shooting at top quality 1080i, and it’s fast too, so there’s little waiting around for thumbnails to load up. We used the HF10 to shoot some outdoor footage in bright light, choosing a complex scene with lots of detail in trees and brickwork (often the first to fade when a camcorder isn’t up to scratch). Indoor shooting followed, with and without its video light, and finally skin tones for portraits. Results were viewed on a Sony Bravia LCD.